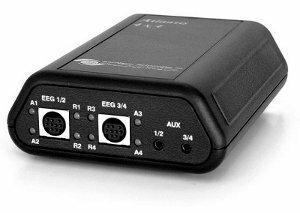 Atlantis 1 Silver Package with qEEGPro Z-Scores - BrainMaster Technologies Inc.
ATLANTIS I is a 4×4 design (with four channels of EEG and four channels of AUX signals) ideal for additional biofeedback modalities. Includes continuous real-time impedance checking and recording; Total Immersion with photic, vibratory and auditory feedback. Evolving 24 bit USB technology. ATLANTIS I and II: Biofeedback with Impedance checking; USB; Direct Current (DC) and Slow Cortical Potential (SCP) measurement, using Triamp amplifier design.